In June, I made a very big decision and am finally ready to share it with the world. I decided to become a Beautycounter consultant. I have so much to share about my decision, but I am going to focus this post on what Beautycounter is and why I decided that I had to get involved! Beautycounter makes safe personal care products and cosmetics and has a mission to get safe products into the hands of everyone. The Beautycounter site does a great job of sharing the company's story, so I won't repeat it (but you can read about it here). But I'll share the gist of it. Basically there are very few regulations and controls set on the skincare and cosmetics industry in the United States. It's a self regulating industry. It doesn't seem like a big deal until you find out that up to 80% of what goes on your skin can wind up in your blood stream. And that the common chemicals found in personal care products could be responsible for the increase in some diseases, conditions, and cancers. Sure, there are plenty of companies out there that will tell you that there just isn't enough research to directly link these common chemicals to the diseases that investigational studies suggest they could play a role in. And they're right, but the issue is that until regulations change and the research has been done, I'd rather not risk it. 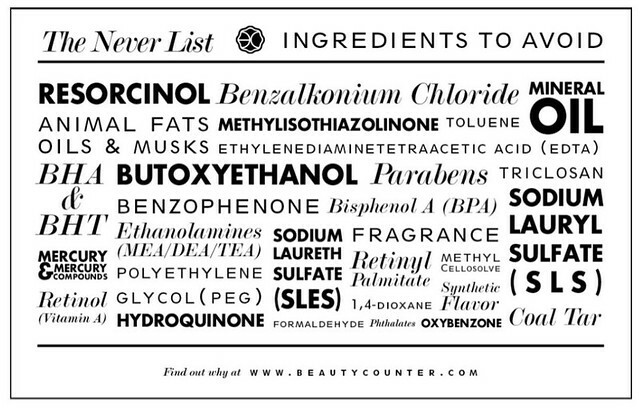 Beautycounter had identified over 1500 chemicals that they will never use due to questions about their safety where people or the planet are concerned. They're a certified B Corp, which means that they want to be one of the best companies in the world, that's also the best for the world. Bottom lines aren't the driving force here, quality, safe products are. And I am very proud to be part of the Beautycounter team. I'll be sharing a little more about my experience with Beautycounter, how I made my decision, and my past experience with direct retail sales in future posts. Since this is a new part of my life, I figured the best place to announce it is the blog about my life! Please feel free to leave any comments or questions here. The Environmental Working Group, the Campaign for Safe Cosmetics, and the Think Dirty app are great resources to look up what you are currently using too! I was shocked to find out how potentially dangerous the products I had used for years are. (if you're product isn't listed, you can compare the ingredients with our detailed "never list".